Feed your pup a wholesome treat with Only Natural Pet All Meat Bites Chicken Dog Treats. 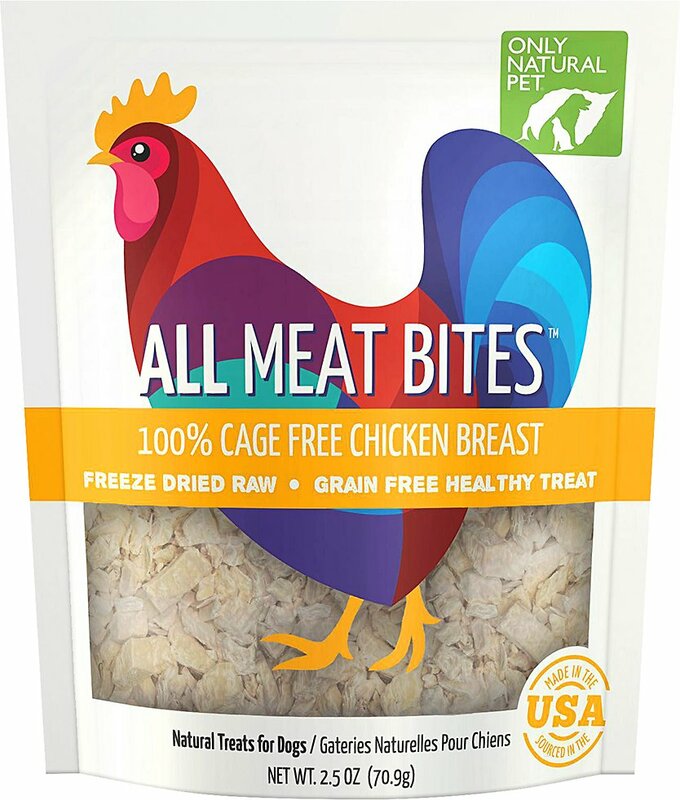 Each bag contains delicious grain-free and freeze-dried doggy bites made from 100% cage-free chicken breast that is never cooked, heated or steamed before the freeze-drying process—this ensures that your pooch gets all the valuable nutrients she needs and deserves. With chicken breast as the only ingredient, it is especially perfect for dogs who are on a limited ingredient diet! Use these gluten-free treats as a snack or give your pup a pleasant surprise and use them as a tasty food topper to add extra flavor and nutrition! 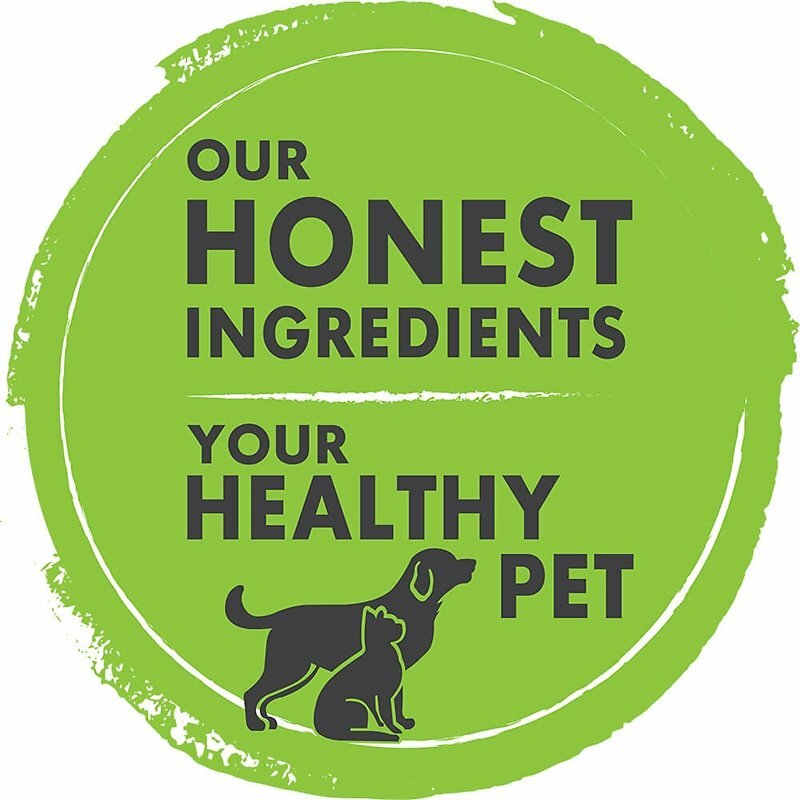 Gently freeze-dried dog treats made from 100% cage-free chicken breast that is never cooked, heated or steamed, so your furry friend gets all the valuable nutrients, protein and enzymes she needs. 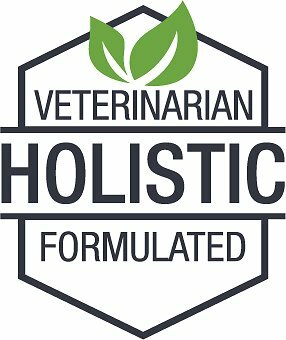 Single-ingredient treat suitable for all ages and breeds and is especially perfect for doggos on limited ingredient diets. Completely grain-free and contains no artificial colors, flavors, preservatives, fillers, corn, wheat or soy. Made and sourced in the USA with the highest quality cage-free chicken without the use of added hormones or antibiotics. 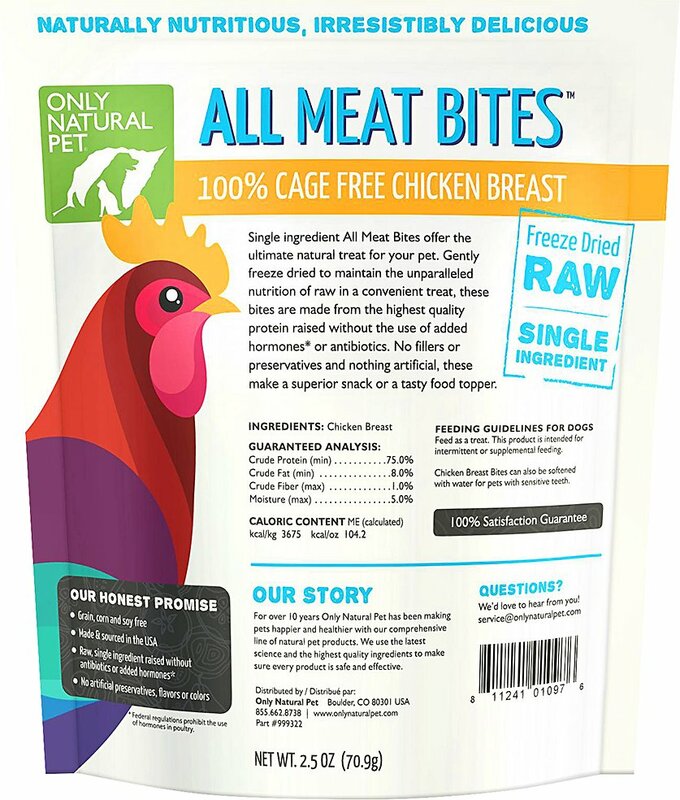 Naturally delicious real chicken taste that your dog will love and can be used as a training treat, an anytime snack, or a healthy meal topper. Feed as a treat or topper. This product is intended for intermittent or supplemental feeding. All Meat Bites can be softened with water for pets with sensitive teeth. We discovered these when they were given to Joey as a Christmas present. They are is all-time favorites, so I had to buy more. We are trying to trim a few pounds off of Joey, so these are perfect, as they are nothing but chicken. My baby girl just loves them. She is allergic to everything so this is a perfect alternative to add on to her salmon dry food or just as a treat. I wish that it came in an economy size. My dog goes crazy over these natural healthy treats! This might sound weird but I took a little taste and they really taste good just like chicken. You can break them up to make smaller pieces. They don't look all that appetizing but my Yorkie goes crazy over these. And they are nutritionally better than most treats. Excellent but pricy. Still worth it for us. Please read descriptions before you buy and are disappointed and rate a product badly. These are treats. 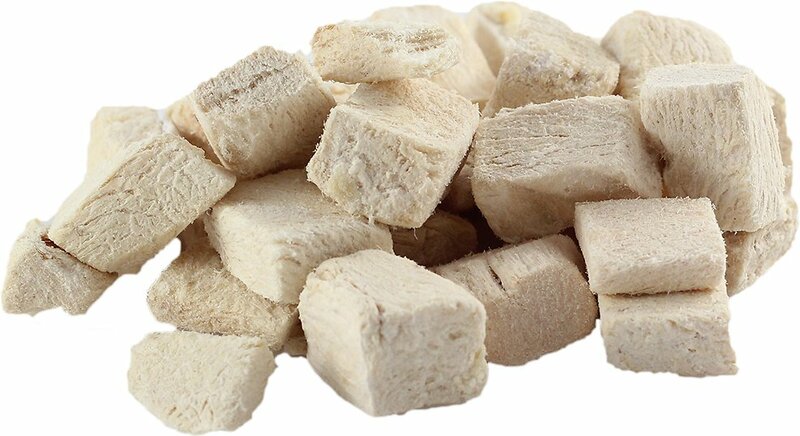 Freeze dried chicken breast. They are not greasy, mild scent, portable (in a bag), and can be easily broken into small pieces. I wet a piece to wrap around pills. They are a bit fragile, because they are freeze dried. They are expensive, but they go a long way with our little dog. I use the crushed powder as a food topper, which encourages him to eat and the larger chunks as treats. They do not upset his very sensitive tummy, so I always have them with me. My two Yorke's love them. There's nothing more to same! My very picky puppy took one bite, and came back for more. I like that it's 100% chicken so I'm not worried about any preservative ingredients as is the case with many other treats. Dog loves these treats. Very easy to help train dog. Not what I thought it would be. A little expensive for this product.